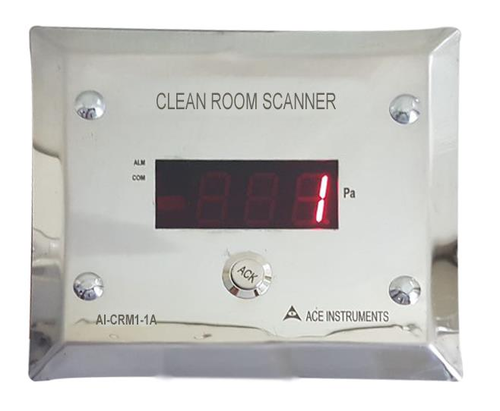 The Clean Room Smart Process Scanner is designed to measure the vital parameters of Differential Pressure in a single instrument in Clean Room Applications with a 1 Line LED Display. The Model AI-DP1-1 is designed for minimum cabling & easy flush mounting in Modular Wall or Brick Walls of Clean Rooms. The sensors for all 1 parameters can be any sensors with industry standard 0-10 V.D.C. or 4-20mA Output. The inputs in the Smart Process Scanner are user selectable between 4-20mA or 0-10 V.D.C. analog with range programmability for each of the 1 parameters. Sensors from Siemens, Honeywell, Trane, Sauter , etc. can be directly connected to the instrument with minimum effort. Additional features include integrated buzzer for parameter violation indication with acknowledgment key, individual LED for process violation and Isolated RS 485 Modbus Communication.The instruments find immense use in Pharma Clean Rooms, APIs, Bulk Drugs, Electronic Hardware Manufacturing Plants, Test Plants, Green Houses, etc. Easy integration to Building Management Systems (BMS) & SCADA inter- facing allow easy set up & great control. Also, available are ready to implement SCADA Monitoring Systems with Screens customized to meet your requirements & plant layouts. So, you can connect multiple instruments from our range of clean room instruments & monitor at a single or multiple (Thin Client) locations. The input range is front key programmable for each of the 1 parameters & input type are selectable from the front end sensor ranges are either standard or customized as per customer specifications. The Smart Process Scanner has additional features like buzzer delay time & password protected Offset provision to enable user to negate any sensor errors . The input ranges are also password protected thus providing protection from unauthorized tampering of the instruments. Ace Instruments was originated in the year 2003. Since our establishment is engaged in manufacturing, exporting, wholesaling, trading and supplying of wide range of Process Control Equipment to our clients across the globe. Our comprehensive range of products includes Clean Room Instruments, Digital Clock, Magnehelic Gauges, Calibrators, Humidity Transmitters & Sensors, Automation System, Flameproof Digital Clock, Digital Pressure Gauge, Sensors, Laboratory Instruments. Our range of products are manufactured using premium quality raw materials that are procured from the reliable vendors in the market. They are made in our advanced manufacturing unit under the supervision of our experts and quality analysts who constantly check the quality of the products. They are available in various specifications and can be customized as per the requirements of the clients. Under the supervision of our mentor, Mr. Chetan Sachdeva, we achieved strong foot hold in the market for our products. By his support and co ordination we captured a position in the market for ourselves.